One of the most difficult challenges we face in our speaking, our careers, and our lives is to let go of the need to be perfect. Rather than helping us achieve our biggest goals, perfectionism makes us doubt ourselves and play small because we’re afraid of making mistakes. 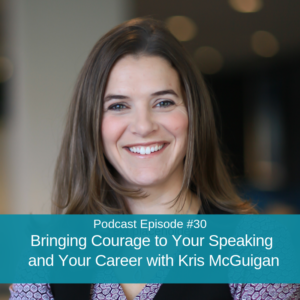 Today’s guest is Kris McGuigan, founder of career management firm Professional Courage, where she tackles our need to be perfect every day through her work and her speaking. Kris speaks on the concept of “perpetual beta,” which encourages us to take the first step toward our goals – whether that’s a new career, a promotion, or a TEDx speaking opportunity – with courage in the face of perfectionism and self-doubt. In this fun conversation, Kris and I talk about her nonlinear path to speaking and how she’s developed her message and mission over time. Kris tells some of her stories about speaking and how she’s landed some great gigs, as well as times when things didn’t go as planned. Kris wraps up by sharing her latest big goal for her speaking and what she’s doing to achieve it. 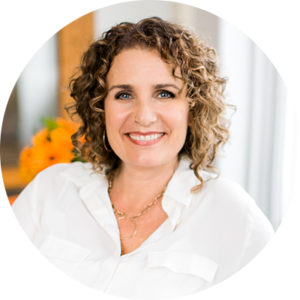 Kris’s unconventional path to speaking and how she’s made it part of her branding and coaching business. Why letting go of the need to be perfect is an essential message of Kris’s work – and one she has to practice every day, too. How Kris landed some of her best speaking engagements and where she wants her speaking to go from here. Why just adding the title “speaker” to your LinkedIn, bio, and the way you introduce yourself can be a powerful step forward. How Kris balances her business and her speaking while battling against perfectionism. You are listening to the Speak So It Matters Podcast, Episode number 30. Welcome to Speak So It Matters, where we share a mix of stories of inspiration and super practical public speaking and communication guidance to help you release all the barriers to becoming the speaker you know you’re meant to be. Some of us are called to use our voice to serve others and our world as well as to become the most fully expressed version of ourselves. If that’s you, you’ve landed in the right place. Let’s do this, my friends. Hello, my speaker friends. I can’t wait to share this conversation I had with you with Kris McGuigan, more on that in a minute. Such a fun conversation. But first, can we just talk about rain for a minute? Because I’m in California and I’m looking out my window onto my back deck and just watching the rain pour down and feeling just overwhelmed with gratitude because, as you may have heard, we’ve had these horrible fires here in California. And while we were just graced this time by not having it right where we are, a couple of hours away, it’s certainly the stories of devastation and just so much hardship and heroism. Amazing people coming to care for others and there are a lot of beautiful human stories in there and also so many sad ones. And yet thought, it has been so dry and just the smoke is even lingering. We’re a few hours away and it’s been lingering so much so that we actually left town. Many people in my area left town for a while for cleaner air because it tends to gather in the valley, especially where we live. But I just am watching the rain and thinking about how incredible our beautiful Earth is and that while these horrible, devastating things happen, we have these built-in systems of healing or wellness. And I don’t say that to minimize any pain and suffering that is going on and that will continue to be a part of people’s lives because of this tragedy and other ones that happen all over the world, but as I look out my window and as I connect with you here, I just wanted to kind of share the gratitude and the blessing that is rain today. So as I dive into this conversation with Kris McGuigan, I think about all of the people out in the world who struggle to just sort of find their way in work that they love, struggle to find jobs and meaningful jobs especially, jobs that feed their soul that feel like they fit them. And I know that the work that Kris does, that her company does, and that she does through her speaking changes lives. Fortunately, Kris is my client also so I get to hear the stories of people coming up to her after a speaking event and just telling her how much one or two even little nuggets or gems that she shares has impacted the way that they’re going to go forward with their job search. So it’s just wonderful to think about Kris and the impact she’s making in that way and also all the tips and nuggets and gems that you’re going to get by listening to this conversation as we talk about her successful speaking career. As I share in our conversation, Kris is the president and founder of Professional Courage, which is a career management services company, and she’s also a frequent public speaker. So it’s fun to talk about how she ties in her speaking with her business objectives because she’s a great example of doing this successfully. Kris is a paid speaker. She does all kinds of speaking but has had some really fun adventures in speaking, in fact, some of the most fun adventures in speaking that I’ve ever heard of. So you’ll get to hear the story about the unexpected ride to her penthouse suite at her speaking gig and all kinds of other things. But we go a lot of places here. We talk about TedX speaking and sort of the fear of putting yourself out there and also the work of doing it anyway, right? Just moving through that fear. So much rich conversation in here. I also want to make sure you know how to get in touch with Kris and her team so that you can get your LinkedIn profile in great shape and your resume reflecting the kind of work that you really want to do and you’re excellent experience. And you can do that by going to professionalcourage.com/strategy. This is where you can spend 30 minutes on the phone with them and talk about your objectives and she’ll provide real-time feedback and all of that. So I want to make sure you know how to contact Kris and get time with her if you’d like. Now let’s dive into this fun conversation I got to have with Kris McGuigan. Hello, my friends. I am so delighted that I get to introduce you to the amazing Kris McGuigan. Kris president and founder of Professional Courage, which is the career management services company and she’s a frequent public speaker. One of the many reasons that I wanted to have Kris on the show on the podcast is that she’s had some super fun speaking adventures and I wanted you to get to hear about them. They’re inspiring and just fun and she’s just got so many cool insights. Kris and I started working together through a VIP day here. So she came into the San Francisco area, we got her this sweet houseboat that’s actually super hard to get, so we lucked out on that, with these amazing views. And when Kris decided to fly out first class, I knew that she was not kidding around. So I know she’s just going to be such an inspiration to you and that we’ll get to dive in on how she keeps putting herself out there even when it doesn’t always go perfect or she doesn’t have the time because Kris has also a very busy, as I said, president and founder of a company. And I know that you are too, so you’re always trying to find that juggle. So Kris is going to give us all kinds of insight and inspiration. Welcome, Kris. Thank you so much. I’m so glad to be here. Yeah, I’m so happy to have you. I know we’re going to go a lot of different directions, but I’d love to just start with how you started speaking. Wow. So the true story of that is back when I was just out of college, I actually had the opportunity to unintentionally speak in front of an incredibly large audience and the details of that presentation are not necessary, but this idea of being able to relay information and then cause action to happen to the masses all at once sort of gave me the bug. And so I always knew in the back of my head it was something I enjoyed. In different corporate careers, I worked in healthcare and nonprofit for a period of time. I loved training and just kind of standing up as a manager in front of teams and talking with people and sharing different experiences with them. And then when I decided to break out and really develop Professional Courage and have my company be my primary source of income, at that point in time, I knew that speaking was going to be a huge piece of that, not only from a marketing perspective but that I had hoped and fortunately now have kind of created so that half of my work is related to the branding side of business and the other half is really out there doing a lot of professional speaking of different sorts. Awesome. You know what? I forgot about that story. I don’t know how I forgot about that story. I know there’s so many different little rabbit holes that we could go down, so I do want to be thoughtful about it. And what I love about you bringing that story up is that I think it’s easy to dismiss some of the things that might have just sort of happened in our speaking world. Probably people listening have had maybe not that exact opportunity. I do want you to give a little bit of detail in just a minute just because it’s so fun. But just thinking back to times when you have been maybe powerfully persuasive and didn’t even really realize that that’s what you had just done because I think we can pull courage and we can pull our own kind of source of inspiration from those experiences. So why don’t you just give, the overview of that amazing speaking opportunity to the masses? Because you moved a bunch of masses to do something unexpected, right? I did. So just after I graduated from college, I had this completely bizarre opportunity to work on a small independent film. And through a series of serendipitous events, I actually became the extras casting director. And as a result, one day I had to persuade an audience of 400 plus people to sort of shift directions. So I was asked by our producer at the time to insight this full unpaid group of people to come in for an extra day for a last minute scene. We were out of money, the weather wasn’t cooperating, we had no more time, and I needed these people who had just spent an entire day off of work, not getting paid, sitting in the hot sun, eating bagels basically all day was all we provided them with, and convinced them that they should show up the next day and do the whole thing all over again for this sort of opportunity for their five minutes of fame. And sort of said all these things on the spur of the moment really just out of sheer panic. It was the end of the day and so I just plead with them to come back the next day, bringing their friends, we need as many people as possible. And then they all just kind of, with tired faces, turned around and left. And I went to sleep that night having no idea what the morning would bring and they actually came back in droves. They had friends with them, and their eyes were bright, and they had even bigger expectations than they did the day before. Quite frankly, I was 21 at that time, but this power of just moving entire crowds of people in just something I said was absolutely amazing to me. It was such a cool opportunity. Two things that are just so hitting me right now. The first is the first half of that message when you were standing up there yelling towards the crowd, inspiring the crowd, is like your message now, which we’re going to talk about. Do you want to go to this humdrum job when you could come back and do something super exciting? So that’s pretty cool. You were saying it way before you were making a whole living saying it. And then second, just this idea that I talk about a lot, which is we are innately capable of doing this. It’s just in there. It was in there for you that day. I don’t want to diss speaking coaching, it is my living, however, I love reminding all of us that this power to use our voice to make a difference in the world, to inspire people, that’s already in there. It’s really just a releasing of all the crap that’s in the way. And for whatever reason, all that crap wasn’t in your way that day. And you knew exactly what to say. A million percent and I’ll tell you for me, and I’m sure we’ll hear this as we continue our conversation, I am usually the crap in my own way. And on that day, I didn’t have time to get in my way. I didn’t have time to stop and think about what I was doing, or be afraid, or wonder if I was going to say the wrong thing. I just needed to get it done. And so there was no opportunity for me to stand in my own way. But absolutely, I agree with you completely. This is what I love about being on a mission. When you’re on a mission and you’re super connected to that mission, even on that day you’re like, “Look, we got to film to make. This is the mission.” But even in your work now, and I know that, and I think we’ll get there in our conversation as well, but that’s a big part of what inspires you to keep going out there. And I know that’s true for many people who are listening. So let’s talk about what your message is now. What do you speak about now? What’s your message? Well, given the branding side of my business, I still do a lot of technical presentations. So I talk with folks about resume writing and personal branding and I work with small businesses on how to utilize LinkedIn and things of that sort, but that is all intended as sort of a foundation so that I can really step into more of the speaking that I enjoy doing now and hope to continue to grow, which is really more of that keynote-esque type of still giving people action that they can walk away with and that they feel motivated by, but is a bit deeper. So you sort of alluded to this idea of being able to just get out there and start going after what you want and not worry so much about what it might look like or whether or not it’s ready. And so quite a bit of what I’m preparing to talk about in 2019 and I’ve shared with a few audiences is around the concept of perpetual beta, which is essentially saying that, just like the software industry goes to market before something is completely perfect and ready, we should go to market with our lives and just be ready to step out and put things out to our clients, or out to the world, or out to perspective hiring managers, or to ourselves, to our families before they’re completely ready and just know that there’s an opportunity to continue to experiment and that we don’t have to have all of our ducks in a row before we step. We can take a step first and then learn how to step stronger each one of those subsequent movements. Amen. I love this and I’d love to hear actually, how did you get to that message? Why does that message matter to you? So whichever place makes the most sense to start, I’d love to hear how you got there and why it matters. I did not get there in a very clear direct linear path, which is how I prefer to navigate life. In our conversations, Michelle, through coaching, I’m one of these individuals, I’m a goal junkie, I’m a quote junkie. To me, there’s like a thousand inspiring things and I don’t know which one I’m most inspired by. I want to talk about resilience or I want to talk about how important it is that you follow your dreams, and I’m kind of all over the board, but the more that we talked about everything that was important to me and in some sense, what you alluded to that we have these moments in our life that when we look back can see were much more impactful, I really began to narrow down and realize that for me, the true secret was in kind of learning how to burn the plan. So to tell someone that they need to be imperfect or that they need to experiment is a challenge. To tell someone who’s as Type A, OCD, I need to have a master plan for every single thing I do, that you have to just get out there and start trying stuff and see what-what works, is very anxiety-inducing. But I had an opportunity in my personal life and quite frankly, a lot of them in my professional life to recognize that there are times that things are just not going to go like you planned and you, at that moment, can decide to just sort of sit down and cry, which is good sometimes. Yeah. That is where most of our messages come from, right? I think for many of us, it takes the two phases. There’s like, we go through this stuff, whatever it is, and then we need to stop at some point, especially those of us who are called to speak and go like, “Okay wait, where am I right now?” It’s funny, you would think that, and I think people do think from the outside when they watch successful speakers out there, like you are, and they go, “Oh my gosh, how does she have such a clear message, such a clear powerful message?” There must be some kind of magical insight you have one day. It just comes to you and then you’re out there sharing it. That would be so convenient. And of course we have moments, right? And you’ve had those along the way I know from talking with you about them where you’re like, “Oh wow, I just realized something.” And sometimes we can articulate it and sometimes we can’t, but there is so much power in creating that space, the place where you can go, “Okay, what have I learned? What are some of those stories? And what is the message at the heart of it?” Giving yourself that space and time to do that is really, seems critical to me. What do you think? Absolutely. As you can tell from the name of my company, Professional Courage, courage and facing your fears and going out there is a huge part of the messaging that I give to my clients and that I personally try to live and embody. And the fact is, it is really scary to believe that you have to be perfect all the time. It’s terrifying to take a breath thinking that you might do that wrong. And so being able to put aside the need to be perfect and instead just the need to take action or to begin moving in the right direction, really helps me personally and hopefully my audiences as well, sort of move from this idea of, I’m not good enough to do this, I’m not ready to do this, I’m too scared to do this, to you know what? There’s not a whole lot to be afraid of because I’m going to go out there and do it and it’ll get better next time and I’m going to learn something. I’m guaranteed to learn something from this situation versus whether or not it’s perfect, which is just far too black and white even though I really love those colors. Yes, right? See how the universe does that to us? That’s kind of amazing, right. Just like everything Kris just said, apply it to the way you’re thinking about yes, your career of course, yes, your life overall, and also specifically, whatever’s stopping you from speaking. Just give it a shot, a smaller stage. Try that message that seems right, right now. I love that. That’s so perfect. So let’s talk about speaking gigs that you’ve done because you have some super fun stories and I want people to hear them. Tell us about a speaking gig that you loved. What was it? What happened? Okay. I had an extraordinary experience earlier this year and perhaps coincidentally or maybe just part of the universe sending us in the right direction, it was shortly after you and I started working together, Michelle. I had booked the gig ahead of time, but I was definitely working strongly with you about preparing for it and I was very nervous because this was really my first paid experience wherein I was going to be moving from this technical space into more of the keynote. I was actually like a women’s empowerment breakfast speaker. Right? So I couldn’t just get out there and tell people all these technical things about what to do with your LinkedIn profile. I needed there to be this element of really moving the room and engaging people on a totally different level. And so I was very nervous but very excited and this was definitely the highest paid experience that I have had to date. And it was extraordinary. I think the universe was sort of blessing me for a lot of the blood, sweat, and tears that I had put out in previous years to try to get to this point. Anywhere from the messaging that I was receiving from the organization before I left my hometown of Cleveland, Ohio to arriving at the airport and having a driver there with a sign ready to pick me up, which was very exciting in a very sort of school girl way. I was like, “Oh my gosh, my name is on that sign.” And of course, because I have to promote myself on social media, I made this gentleman take a picture with me and my little sign, which incidentally, they no longer have just on paper signs. They use iPads for that, which makes so much more sense, but it was a little sad because then I couldn’t take my sign home. Anyhow, we get into this car and there’s a giant Escalade, I think. I’m the only person in the car and there’s a cooler back there with all these beverages for me. And we’re driving to this complex where the hotel and the resort was. And as we’re getting closer, he gets this phone call or he calls, excuse me. The driver calls someone and I hear him say, “She’s approaching now,” and I’m thinking, “They can’t be talking about me, right?” Apparently, he was because as I step out to the vehicle and people get my luggage, the manager of the hotel greets me outside, takes me into this special set of elevators, and the entire time I’m like, “They have the wrong person. This can’t be happening. They must’ve misunderstood,” and he sends me up to the penthouse. And I get off this elevator and perhaps maybe too much insight into how green I was at the situation, but I get off this elevator and I’m staring at a sign that says … I have two room numbers on my card and the sign is pointing in both different directions. So I’m like, “Where am I, what room am I in?” But fortunately in that moment, my mother taught me very well and she’s been in a lot of great business situations. You just kind of have to fake it until you make it. So something told me not to go back downstairs and assume that this gentleman who met me outside had made a mistake. So I go to one end of the hallway and I open this door. Well, it turns out all three of the doors on that floor belonged to my two-story penthouse suite, which included in one room a grand piano. The universe really provided for me that weekend because it was just unbelievable. There were so many rooms in that place I got lost. I couldn’t find where I was and I kept finding more bathrooms and more places to sleep and it was just me. So it was just an extraordinary experience to have that be one of my first main gigs out the gate and have the white glove treatment unexpectedly. It was extraordinary. I’ll never forget that experience for the rest of my life. It is so fun. As I said to you then and I’m laughing about it because this is not the norm and I deal with a lot of sneakers. Sometimes we get picked up in a really nice car and we definitely get to stay in some very nice hotel rooms, single rooms in my experience, but I think that’s such a fun story about how it can go. When you’re putting yourself out there, you just don’t know what kinds of things will happen. And how did you get that gig? Wow. So I do obviously in addition, well not obviously, in addition to my resume writing and branding work, I am also a certified career coach. 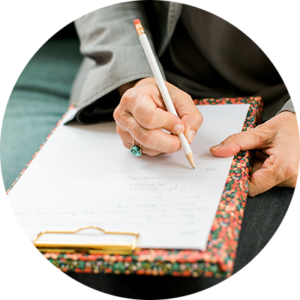 So I do a lot of career coaching for individuals that are just either looking to advance within their current field or perhaps looking for a change. Sometimes those are individuals just like me who, suddenly in the middle of their corporate career realized, you know, I’m not in the right space. Maybe I need to go off and do my own thing. And one of the individuals that I had been coaching the year prior actually called upon me. She and I, we had just done advancement coaching. Yes. I suppose I will try to make room in my schedule. So this was actually a prior client of mine who did not even know that I was a speaker and was reaching out in hopes that I would perhaps inspire an audience the way that she and I had interacted on the phone. I love that. It’s funny. It is a mystery. It’s such a mystery how to get great speaking gigs. I know it’s still a mystery you and I talk about, right? Even my clients who are out there speaking regularly, there’s always the question of, I want to speak more, if that’s one of their goals, and it usually is. And so we still have to ask the question, okay, where else? And how are we going to offer to speak there or make a connection there? Whatever, but also just the power of, in this case, you hadn’t even said you were a speaker. So I was going to say the power of just adding that onto your title or the way you introduce yourself can be such an easy way to naturally let the world know that you speak. Yes and I would say, and I don’t know until right now, which I realized how much similarity there is between coaching people through careers and the work that you do, but what we often say is the job search is a lot like a maze. So there’s some people that have the opportunity to just step in and they just unintentionally kind of stumble upon the correct path right away and make it out to the other side. And there are others of us who step in and we keep banging up against the wrong wall and we have to keep trying and trying. And so there’s really not a foolproof method of stepping in and making it straight through. But obviously, just like for careers, just like speaking, the more times you put yourself out there, the more lights you shine upon yourself or upon the walls of the maze, the more likely you are to go through, the more that you’re able to learn from past experiences and not make the same wrong turn. There’s so many … If you shout louder or share your message with more people then more people can help to navigate through. So there is definitely a correlation there, but I do believe that it’s a lot like a maze. Some people just make it out much quicker, but we can do things to help give ourselves an advantage. But at the end of the day, it really is, you don’t know how long or what to expect when you first step in. Yeah, and it doesn’t mean anything about how good you are as a speaker or that employee in that job or in that role. Right? I don’t know, just to kind of like play with it, maybe it says something about how good you are at going through mazes. I don’t know, but that’s not really relevant. And also like you said, it could just be luck, right? You happen to walk into the one that goes straight through. And so if we use that as the guide that says, “Oh, I must not be meant for this because it didn’t happen for me that way,” it’s just inaccurate. I completely agree because yes, it’s not that simple. There’s no other way to put it. It’s just not that simple and it definitely doesn’t mean you’re doing something wrong. It just means you perhaps took a turn and now you need to make a different turn or now you need to go back from a little bit back where you came and then go in a different direction or try something new. Or sometimes, quite frankly, just sit down and breathe for a little while because it’s exhausting running through a maze, right? Perpetual beta, there it is, coming up again. So one of the things that people are really nervous about, and I think one of the things that stops people from putting themselves out there to speak probably more subconsciously, is really they’re sort of getting way ahead of themselves and they’re afraid of what might happen if they get it. So that we want the gigs. That’s what’s at the forefront. We want the gigs. The problem is I don’t know where to speak, and I don’t know where to get the gigs, but the truth is back there is this fear also. What happens if you do get that awesome gig? Is there a time when a gig didn’t go the way you planned? And what happened? Sure. I would say every time I go somewhere it doesn’t go exactly as intended. I’ve been lucky or maybe it’s a bit to my personality. I’ve not had any sort of massive … I’ve never tripped on stage and fallen over, although quite frankly, my personality says that I would just roll with that anyhow. But I would say the most recent unexpected situation is that I was getting ready to give, again, more of a technical type presentation, but the contract was a bit loose so I could have kind of gone in there with any phrase, but the building, this was for an association, so about 50 women in a room and the building that they had secured for the presentation was an entire wall full of windows. So we had no opportunity to use the slideshow that I planned for. There’s a lot of things that PowerPoint can do to enhance a presentation, but there’s certainly a lot of crutches that it also provides. And so instantly when I walked in the room, I had to make a decision. Am I going to sit here and be one of these people that’s trying to fumble around with technology and just awkwardly stumble through and constantly blame the fact that you can’t see my slides for why this is not an exciting event? Or are we just gonna toss this slides out the window? So I made that decision, sort of spur of the moment. Again, courageously decided we’re just not going to go with slides and we’re going to make it look like I wanted that to happen. And so kind of went through. I would say that my opening was a bit weak because I was putting too much thought into what I was about to get ready to say. And so I think that it did take away from my ability to come out very strong, but once we got talking, the women in this room were very engaged and they were certainly much more interested in watching me and hearing what I had to say and engage with them versus things off of a screen. And I was still able to articulate some of the technical pieces, what we needed, and offered them sort of a follow-up documents so they could see some of the actual samples of documentation. But we kind of went with it and I will say that when I walked out of the room, while one of the scarier presentations I’ve given, it was probably one of the best presentations that I have, my assessment of my own performance, I feel like that was probably one of the better presentations I’ve ever given. Amen to that. I can’t even tell you. I just did a podcast, I think it’s called What To Do When Your Presentation Slides Fail You or something like that, literally. And we’ll link to it in the show notes too, because I think it is a really good sort of follow up if someone’s listening to this. You are so not alone. I have heard that over and over and over again. In fact, in that podcast, I tell the story about having just seen, I just went to a conference and watched the exact same thing happen. There was a big window behind the speakers and he said to the meeting organizer, actually the lead of the event, “All right, where should I send my slides?” He was telling this story and she’s like, “We’re not using slides.” So same thing, he ended up, and it was absolutely amazing. Yes. I’m going to sound like I’m sidetracking, but I promise you there’s a point to this. So I went, crazy story. This just happened. This past weekend, I went to a Friendsgiving event with my husband. And my husband participates in community theater and so he has a lot of friends who are really into music and acting and all of these things, and I’m very happy to be in their presence and enjoy all of that. Well, in this particular event, it required each person who was attending the dinner to stand up and sing a solo while the host played the piano, which while I love to stand in front of audiences of thousands of people, it terrifies me to sing even in church next to my family. But here’s what was amazing, and this is what I always think of. I think of something similar when moments like that happen in a presentation. When people want to make sure you know that they’re not at their best because they don’t have their slides, or they want you to understand that there obviously like, well, this was going to be a great day, but unfortunately, there’s no slides here. It just makes everyone uncomfortable. One of the individuals of this party got up and just talked incessantly about he didn’t know the words to the song and he wasn’t ready. He didn’t know we would be singing. It was just really uncomfortable for everybody and then we felt like we needed to make him feel better about what was going on. As a speaker, you don’t want their focus to be on making you feel better. And so when I got up there, I was beyond terrified, but I thought, you know what? I’m just going to roll with this because I don’t want everyone in the room to be as uncomfortable as I am right now. So I have to just pretend like this is a great awkward situation to be in. And I think, again, the same thing on stage. Those women didn’t come there to listen to me talk about how I’m a much better presenter when I have slides. They came there to listen to me present and making them, as much as I think it sort of serves as like kind of puts up a wall or helps us with our vulnerability to make sure people knew that this is not what we expected, at the end of the day, we’re just distracting from their experience. And so I think that whether you’re singing Friendsgiving party unexpectedly, or presenting without slides, or presenting in the dark, or presenting to a completely different room of people than you expected, ultimately, your job is just to make sure that they’re hearing you and that they’re enjoying themselves. And it’s really hard to enjoy yourself when someone’s reminding you about things are not the way they expected them to be. Mic drop. That is exactly true. That’s beautiful and perfect. And what I love to say, one of the mantras I carry around and love to share is we are a steward of their experience. That’s our job. And they’ve come for something when you’re standing up in this leadership position as a speaker for this audience. What a beautiful and kind of unexpected example, but it’s such a good one. Right? And you sat there in that “audience” at the table going like, “Oh, this is not how we want to feel.” I love that. I will say that I came back to my seat and my husband said, “You don’t know the words to that song?” And I looked at him, I said, “This is not what we do.” This may be totally normal to you, but this is not what we can do. Exactly. I love it. So I know we are at the end of our time or almost at the end of our time, but I really want to talk about TedX for just a minute. If we could just sneak in a little bit about TedX because I know that TedX is what you are working on right now. Absolutely. So TedX is a major goal of mine and quite frankly, that goal came from our time together in San Francisco. Having another human being who certainly knows a lot about speaking, but quite frankly, just having another person validate and look at me and say, “Why isn’t that one of your goals? Like, of course, you can do that.” And I suddenly thought, “Well, of course, I can. Why wouldn’t I do that?” And so that has become a big initiative for me, a big focus for me. However, ironically, it’s been a struggle to not try to do it perfectly. So I’ve spent a lot of time working with you and working on my own to just sort of figure out, how do I just convince myself that it’s okay to start applying and not know exactly how it’s gonna work, and not know exactly what I’m going to say once I get onto that stage? And so I’m putting myself out there. I’ve started to apply to a few different locations. But my goodness, even just trying to decide what the first location I would apply to was this massive situation. And when I put myself in the shoes of my client, I think, my God, if you spend three months deciding which single job you were going to apply for, we’d be here for a really long time. And so I’m trying to sort of walk the talk that I tell my clients and embrace all of these ideas of it’s perfectly acceptable, in fact in many cases, more beneficial to be imperfect than perfect. It’s like my own personal struggle. So it’s very interesting and very meta situation going out with my goal to get to TedX. But I certainly hope that sometime in 2019 I will be able to grace one of those stages. And you will. I know you will and we will update. I will share with our podcast listeners when and where because I know that it will happen. It’s one more unexpected insight during this conversation with you. I didn’t realize it, but you just coached yourself through the whole like, yes, of course, I’m having all these thoughts, but if in fact, I were coaching another one of my clients about a single job application, it’s true and it’s the perfect application of perpetual beta also. And I know you know that, right? What I love is that this conversation is just what I hope is that people who are listening recognize that, yep, it’s okay. It’s okay if that’s exactly the kind of thinking that you’re having because I know that many of them are because you are not alone among my clients with that conversation around TedX. It’s okay. We make this big deal of it in our mind, but the truth is there are many, many TedX stages and I know you know that. And you will be on one and you’ll be on one even if you keep having that same conversation in your head while we go through the process of you applying. Despite myself, I will get there. Just like your clients who are looking for a job and all of us out there just trying to figure out whatever the next big goal is. It’s perpetual beta. I love it. So as I knew it would be, this has been so much fun, even more fun than I imagined. So thank you for being here. I know this is going to be inspirational for so many people who are just kind of wondering how to make this whole speaking thing work and also who might think that for those that are out there successfully speaking, that it all feels perfect and streamlined all the time. It’s just a beautiful human experience right? And that you can do this. You’re running a very successful business. Speaking isn’t your business, it’s just part of your business. So it can be done. No, and to be fair, my business is not my business either. I have school-aged children and a household to run, so I’ve got a couple of balls in the air. But yes, to your point, I think that speaking is a perfectly imperfect process. Yeah. Well, thank you so much Kris. I’m so excited to get to share this with our audience. I am as well. Thank you so much. All right, my speaker friends. I hope you enjoyed that conversation even half as much as I did. I think you could hear each time I had a new insight. I think Kris and I went back and forth a number of times having new realizations, which is funny because we get to have sessions together with some regularity, but there’s something about having this conversation for you that was also really powerful for us too. So I hope you got to enjoy it and you got the gems and nuggets out of there that will serve you best going forward. Remember, you can connect with Kris at professionalcourage.com/strategy to get your own session with her. And as I tell you every week, remember, you also can get the Get Started Speaking Guide at michellebarryfranco.com/yes. That’s the guide that’ll give you the only presentation outline you’ll ever need, plus all kinds of other tools that will help you just get out there and start speaking. So what a powerful combination, right? You can go to both of those places and get powerful resources going forward. Thank you so much for being here. As always, it was an absolute delight for me and you know that I’m always cheering you on, right? Because you were made for this. I know because you know. See you next week.